The definition of curiosity is “a strong likeness to novelties and desire to know or learn something.” A broader interpretation would be a something that drives someone to be engaged and interested in making new ventures. Therefore, performing arts experts and artists may use curiosity as a driving force for their artistic creativities or as a stimulant to find new stages and communicate with other artists. 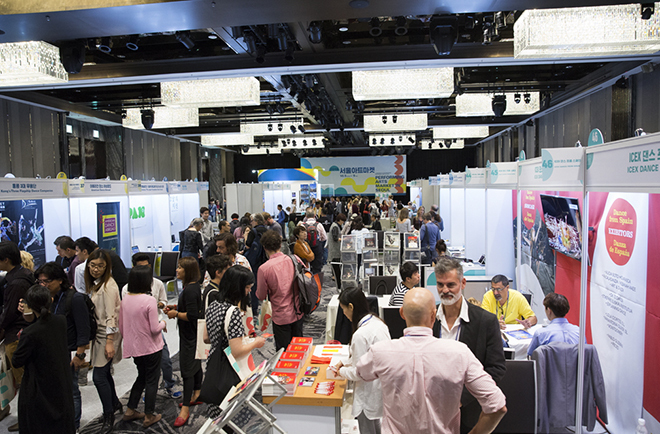 Organized by the Korea Arts Management Service, Performing Arts Market in Seoul(PAMS) 2016 will function as a platform of exchanges and communications for Korean and international performing arts professionals with their full of curiosity. In 2005, as the first international performing arts market of Korea, PAMS was launched to activate reasonable distribution and overseas expansion of Korean performing arts. PAMS consists of PAMS Choice showcase, which introduces various genres of performing art, and booth exhibitions to promote performing groups and their works. Additionally, information sessions and networking programs can help international performing arts professionals to share information and develop creative ideas on their works. The participants can explore new possibilities through these diverse programs. PAMS Choice showcase, one of the most representative programs in PAMS, can help participants to scope out the current trends of Korean performing arts. This showcase has been functioning for Korean performing arts professionals to establish a foothold of leaping forward overseas. When these PAMS Choice works are to be invited by the international presenters later, the artists or companies can get funding opportunities (ARKO-PAMS fund1), Center Stage Korea and more). Since 2005, PAMS has selected 163 PAMS Choice works; 14.8 works in averge annually. These works have been presented more than 1,000 times in overseas. The booth exhibition provides artists or arts groups another opportunities to promote their works. In 2016, PAMS plans to expand the scale and period of this booth exhibition. There are other programs such as PAMS Link introducing other performing arts works being held at the same period with PAMS, the Looking for International Partners (LIP) Pitch Session where cooperative artists and organizers build the partnership to realize their ideas, Speed Dating where participants have one to one meetings with the programmers of international festivals and theaters, and PAMS Night that allows free networking activities between participants. As PAMS has been receiving more artists, presenters, promoters, administrators and other performing arts professionals, there will be various chances to meet their preferences and demands of participants this year. 1) PAMS Choice selected performers will receive various forms of advanced overseas support, including the ARKO-PAMS Grant (Arts Council Korea offered), the subtitle translation service (offered by the Literature Translation Institute of Korea), education and consulting on overseas advancing strategical planning and other forms of diversified support. PAMS designates a ‘focus region’ every year to introduce trends and information on the performing arts. The network that relates the focus areas has been expanding from Korea to Asia, Europe, Latin America, North America, Nordic areas and other regions. This year, to set new international stages, the Middle East was designated as the focus area. Recently, the Korean wave has swept the Middle East. Therefore, their interest in K-pop, tourism, sports and other factors related to Korea are highly expected. The NYUAD Arts Center, Louvre Abu Dhabi, Guggenheim Abu Dhabi and other cultural art facilities were established on Saadiyat Island 2), as a special cultural area in Abu Dhabi, UAE. The supply and demand of content rises as more infrastructures are added. Due to the magnanimity and openness of Islamic culture, PAMS 2016 would like to introduce the tendency of performing arts in the Middle East under the expectation that Korean performing arts will be accepted without repulsion. 2) Saadiyat Island is 500m away from Abu Dhabi. It is being developed as a cultural attraction and residence. By 2020, 27 billion dollars (around 27 trillion won) are going to be invested. The construction will be completed in 2018. PAMS will continue exerting its best effort to communicate and exchange between Korean and international artists and professionals in performing arts. This will be a key platform to expand Korean performing arts into new stages. PAMS 2016 will take place from October 4th (Tuesday) to October 8th (Saturday) in Arko Arts Theater, Daehangno Arts Theater, Hongik Daehangno Art Center Gallery and more. More details about PAMS 2016 will be available on the website of the PAMS (www.pams.or.kr), which will open on 4th July.